Darshan Kadian collected nine raid points for U Mumba. In the match between U Mumba and Bengaluru Bulls, Darshan Kadian, Surrender Singh, and Abofazl Maghsod collected nine, five and five points respectively for the hosts while Bengaluru's Pawan Sehrawat, Rahul Chaudhary and Kashiling Adake earned eight, six and four points respectively for their side. Darshan and Abofazl picked one point each in their very first raid attempt as U Mumba started with a 2-0 lead before they tackled back Bengaluru's Pawan and Kashling to move to four points. Darshan continued to make successful raid attempts and picked a point again, which also left the visitors with just two men on the mat. It seems nothing was going in the visitor's way as their raider Mahesh Maruti was also tackled by the host, deteriorating Bengaluru's situation further. 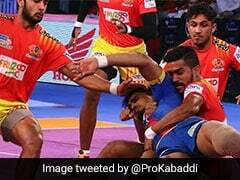 Darshan raided again successfully as U Mumba inflicted an All-Out to take a huge 9-0 lead. A dominant home side further extended their lead 12 points while their opponents were still looking to open their account by the 11th minute. Skipper Rahul finally gave some respite to Bengaluru with a successful raid but it was too late as U Mumba had already taken an 11-point lead. The host continued with their fantastic show in the later part of the first-half too as the scoreline read 17-6 in U Mumba's favour at half-time. Just in the initial moments of the second half, the host inflicted another All-Out to take a massive 24-7 lead. The visitors then collected few points in quick succession to reach 11 points while U Mumba could only manage one however, the score was still in the host's favour with 25-11 by the 29th minute. The visitors, however, fought back brilliantly as their consecutive successful raid and tackling attempts lifted them to 20 points, while U Mumba could only pick one point by the 35th minute as the scoreline read 26-20. Kashling's super raid took Bengaluru to 24 points, cutting the deficit to just five points with three minutes left. Pawan then made a successful raid again for the visitors to make the scoreline read 29-25. The home side then collected three points in back-to-back attempts to move to 32 points, seven more than their opponents'. Bengaluru collected four points in the final moments of the contest. However, it wasn't enough to stop U Mumba from registering their ninth win out of 12 games this season.